To ask L.A. Cotton questions, please sign up. How many books are expected in the Wicked Bay series? L.A. Cotton Hi Lorie - sorry for the late reply. Wicked Lies (Kyle and Laurie's story) release March 29 and then I have another Lo and Maverick story planned and…moreHi Lorie - sorry for the late reply. Wicked Lies (Kyle and Laurie's story) release March 29 and then I have another Lo and Maverick story planned and Macey's story after that. After that, I'm not sure. I'd like to do a Summer and Nick book and possibly another Lo and Maverick, but we'll see. are there just 3 books in the chastity falls series? L.A. Cotton Hi Lizzie... there will be four books in total. The first three (all available now) are Ana and Jackson's story. Book four, we will be Braiden's story…moreHi Lizzie... there will be four books in total. The first three (all available now) are Ana and Jackson's story. Book four, we will be Braiden's story and is set three years after the first books (and pick up from the epilogue of Tribulation and Truths). 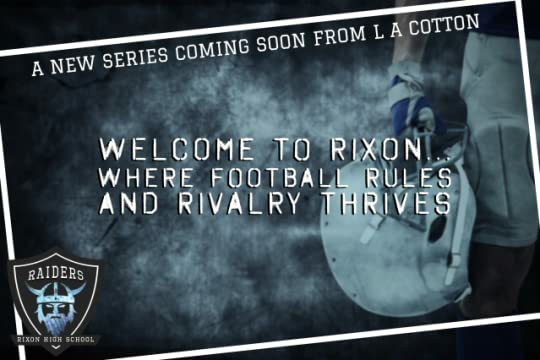 L A Cotton has a brand new series coming full of cocky football players, school rivalry, and the girls who get in their way! We’d love your help. Let us know what’s wrong with this preview of Waiting on the Sidelines by Ginger Scott. I have brand new series coming full of cocky football players, school rivalry, and the girls who get in their way! The Trouble With You will be releasing June 19th ...more "
We’d love your help. Let us know what’s wrong with this preview of Scoring the Quarterback by S.M. Soto. We’d love your help. Let us know what’s wrong with this preview of Secret Lucidity by E.K. Blair. We’d love your help. Let us know what’s wrong with this preview of Lines by Anna B. Doe. We’d love your help. Let us know what’s wrong with this preview of Always by C.L. Matthews.